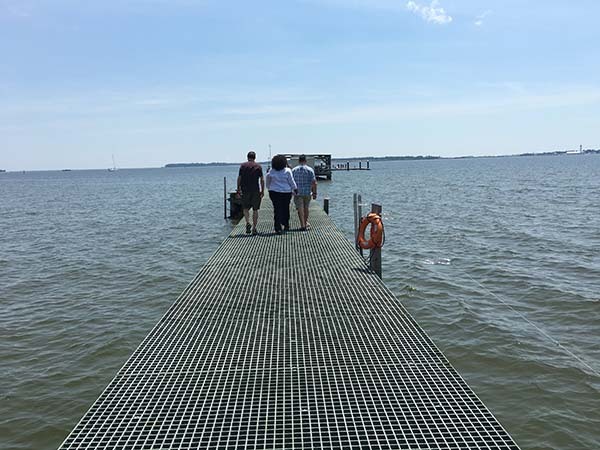 On a bright and sunny July day, IOOSians met up on Solomons Island in the Chesapeake Bay to see research and development translated to operations first hand! 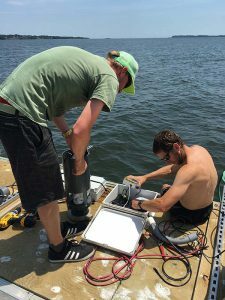 The challenge kicked off nearly a year ago and with five teams from all over the world designing to meet the competition objectives: a sensor that can continuously monitor the nutrient content of sea water for 3 months unattended, transmit data in real-time, and is available to the consumer at $5,000 or below. Once the prototypes were ready, the deployment stage began. In spring 2016 there was a 3-month deployment in the freshwater of the Great Lakes. 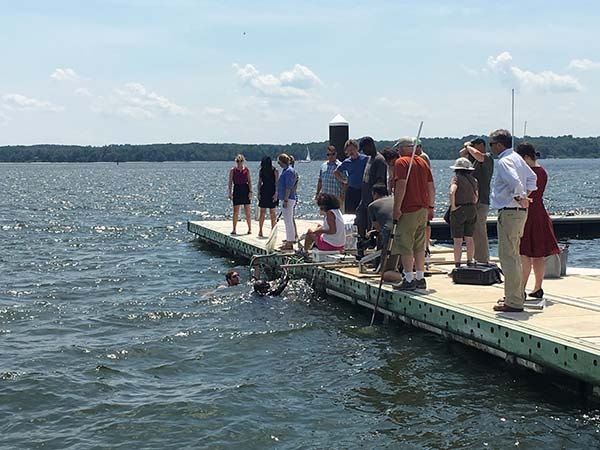 Lessons learned and prototypes adjusted, the teams have now moved onto their brackish water challenge: 3-months in the Chesapeake Bay at the ACT facility at the University of Maryland Chesapeake Biological Laboratory on Solomons Island. Once this step is complete, the final test–salt water in Hawaii–will be the final test for these new sensors. During this brackish water challenge, the IOOS program office was able to visit the deployment site and talk shop with the teams. 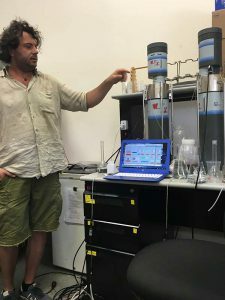 Tom Johengen, (U. Michigan and Cooperative Institute of Limnology and Ecosystems Research) then stepped in to play lead coordinator for the day, including a short tour of each vendor’s instrument preparations; mid-day and afternoon deployments off the ACT / CBL pier; and a review of the data streams flowing from the newly deployed sensors. For the IOOS team, this was a much-anticipated opportunity to engage with vendors and PIs in a collaborative, informal environment where shared excitement over R&D affected everyone. 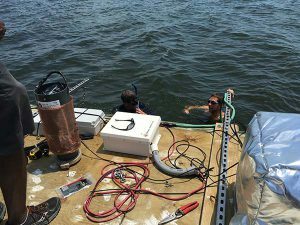 “It was amazing to see the variety of ways the teams were innovating to overcome the challenges of monitoring conditions in salt water,” said Carl Gouldman, IOOS Deputy Director. Only two of the five sensors are being derived from previously commercialized technologies, and the vendors indicated that the challenge has pushed them to think in new ways to achieve the objectives of the challenge. 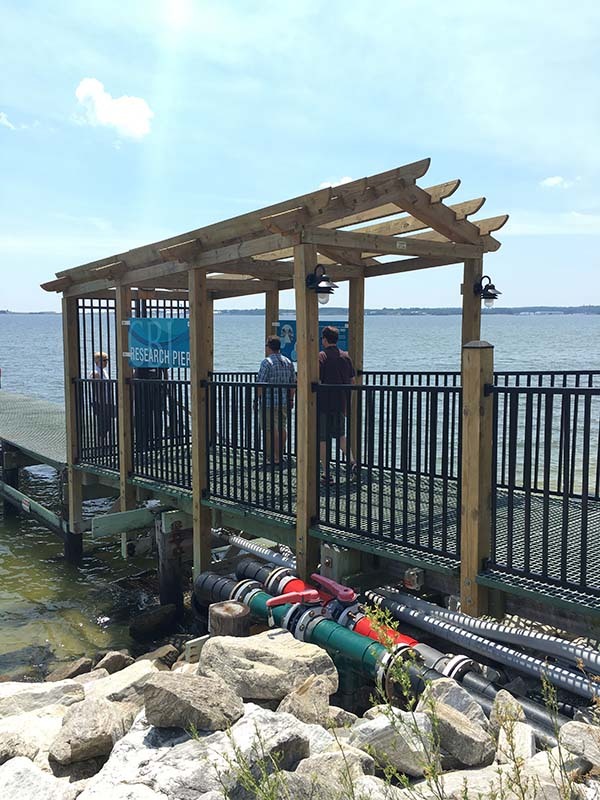 A visit during the second deployment phase was particularly interesting, as the challenge teams had already executed their freshwater deployment in the Great Lakes and the IOOS office got to see and hear how they were working with issues that arose during that time as well. Of particular interest was seeing how they all were addressing biofouling, one of the chief obstacles to overcome to allow for lengthy in-water use. 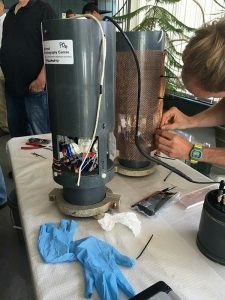 From fine copper mesh to prevent biofouling to utilizing pelican cases for long-term support of surface tech, there were lots of good ideas on deck. Next up: three months deployment in the salt water of the Pacific off Hawaii, and then to market!